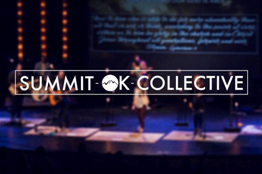 Summit Collective is a group of believers that desire to point people to Jesus through the worship experience. They are a part of a local body called Summit Church, but have a heart for the "Big C" church to be united and to proclaim the name of Jesus to the world. They want Jesus to be the hero of every story that comes out of the opportunities they lead. They led us in worship during BenchMark 2018 and PEAK 2018. We love this group and their heart for the Lord comes through their music.